Lady’s Picture is not included. Replace it easily by your own via Smart Object. Link in the help file. Title: Double click on the smart object layer “Double click to edit”, edit your text in the new opened window and Save. Other Text: All the text is editable just by simply double-clicking on the text’s layer in Photoshop, and just typing in your desired information. Model: Double click on the smart object layer “Double click to edit”, place your model in the new opened window. Save. 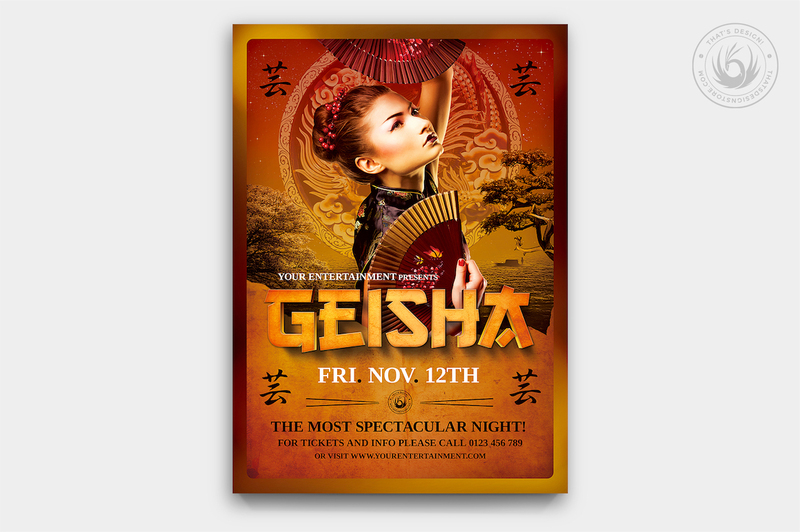 This Geisha Party Flyer Template psd 3 was designed to promote an asian Party, Japenese Electro, Dance, Minimal,House, Alternative or a Restaurant. Club 112 Flyers BIG Bundle for $29. 300 Flyers Massive Bundle for $39. 3 Geisha Party Flyer PSD for $14.